Subaru haters like Njoki Chege may hang themselves as the car remains a favorite to many. Subaru’s are mainly preferable in sporting activities as it is believed its best for speed and its flexibility. 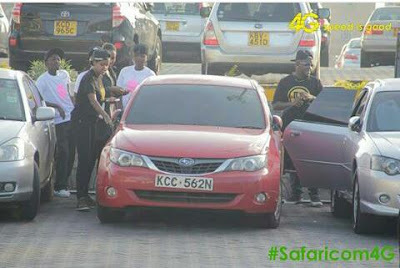 Well Radio Tag team Amina and Dj Joe are one of the celebrities to be Subaru enthusiasts judging from a recent safaricom event where the two flaunted their subarus. Amina was in her red Subaru Impreza while DJ Joe was in his beloved silver Subaru Legacy.